What is the difference between Spiritism and Spiritualism? For new ideas new words are needed, in order to secure clearness of language by avoiding the confusion inseparable from the employment of the same term for expressing different meanings. The words spiritual, spiritualist, spiritualism, have a definite acceptation. Strictly speaking, Spiritualism is the opposite of Materialism; a Spiritualist is the one who believes that there is in him something more than matter, but it does not follow that he believes in the existence of spirits, or in their communication with the visible world. Therefore, instead of the words SPIRITUAL SPIRITUALISM, Kardec employs the words SPIRITIST, SPIRITISM, which, by their form, indicate their origin and radical meaning, and have thus the advantage of being perfectly intelligible and well designate the new concepts. The fundamental principle of Spiritism is the relation of the material world with spirits; and the adherents of the spiritist theory are spiritists. In a special sense, “THE SPIRITS’ BOOK” contains the doctrine of spiritism; in a general sense, it appertains to the spiritualist school, of which it presents one of the phases. It is for this reason that Kardec have inscribed the words Spiritualist Philosophy on its title-page. “Spiritism is at the same time a practical science based in observation and a philosophical doctrine. As a practical science consists in the connections that we can establish with Spirits; as a philosophical doctrine comprehends all the moral consequences that arises from those connections. Spiritism is a science because it is born of experience and reason as any science of observation. Therefore, as its object of study are the spirits and spirits are moral beings, the moral consequences arise naturally. The philosophical doctrine, which was derived from a methodic study of the information received in communications with discarnate spirits, brings answers to man´s common questions – who we are, where we came from, where we go to. 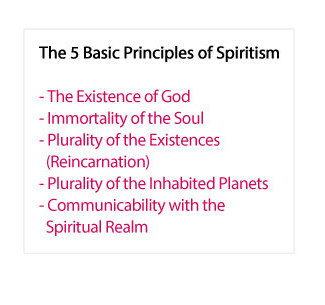 Spiritism deals with the details of spirit life and the journey of evolution through the process of reincarnation; the natural laws that govern progress; and the role we play in our own moral and intellectual development as immortal spirits. Considering the usual and dominant meaning of religion, we can say that a doctrine cannot be science and religion at the same time – for the simple reason that a science requires freedom of discussion to build knowledge which can and do modify as time passes. Kardec gives us a NO and a YES to answer to this question, whereas we have one word used in different meanings. NO, says Kardec, Spiritism is not a religion in the common and dominant meaning of the word religion which carries the idea of priestly hierarchy, ceremonies, privileges and strict dogmas. Spiritism has none of these characteristics. But absolutely YES, says Kardec, Spiritism is a religion since in the philosophical sense, the word religion means a bond. Thus, a religion in its broad and true sense, is a link that reunites men in a communion of feelings, principles and beliefs. The bond created by a religion, whatever its objective, is one of a moral essence that brings hearts together. So we spiritists seem to be united in an ideal, an essentialy moral and spiritual bond – and that can be called our religion. Once we have not a material contract nor a mandatory practice, what should be this feeling – this natural law – all our hearts should converge to? Charity to all it is; love to the neighbour in the greatest sense of the word; love which encompasses the live or the dead for they all compound humanity. Charity is the soul of Spiritism. Spiritism defines itself as a christian religion and, as Jesus, it recognizes the omnipotence of God, creator of the visible and of the invisible and immaterial world. Therefore, from a moral perspective, we follow the teachings and examples of Jesus Christ, as our model and guide. The Universe is God’s creation. It encompasses all rational and non rational beings, animate and inanimate, material and immaterial. The are other inhabited worlds in the Universe, with beings at different degrees of evolution; some less, some equal and others more evolved than human beings on Earth. All the Laws of the Nature are Divine Laws because God is their author. They cover both the physical and the moral laws. Spirits reincarnate as many times as it is necessary for their spiritual advancement. Humans Beings are given free-will to act, but they must answer for the consequences of their actions. Future life reserves for Human Beings penalties and pleasures according to the respect they do or do not show for God’s laws. Prayer makes Human Beings better. Whoever prays with confidence grows stronger against bad tendencies, and God sends the Good Spirits to assist them. This assistance will never be denied when requested with sincerity.